Last day to do the last nonathlon distance: the 1000m. I had about 3 hours left when I sat down to do it. No panic, though. I knew I could do a 1000m in under three hours. I also knew I wouldn’t beat my PB. We had some visitors from the US yesterday evening and we had to taste some Moravian wine … 😳 Followed by a long working day, and a 1km attempt too short after dinner. It would be hard to come close. So the plan was to take 10 strong strokes after the start, then settle on 1:40 and keep it as long as possible. So according to nonathlon, my 500m is my best SB with 930 points, followed by my 1000m with 920 points, then the rest. My worst SB according to nonathlon is my 60 min effort with 904 points. According to the Concept2 ranked pieces, my 5km SB is my best at 92nd percentile. The 1000m is among the worst with 84th percentile. I also tried to fit a “Paul’s law” like curve through my SB data. The fit gave a 4.8 seconds split increase per doubling of the distance. 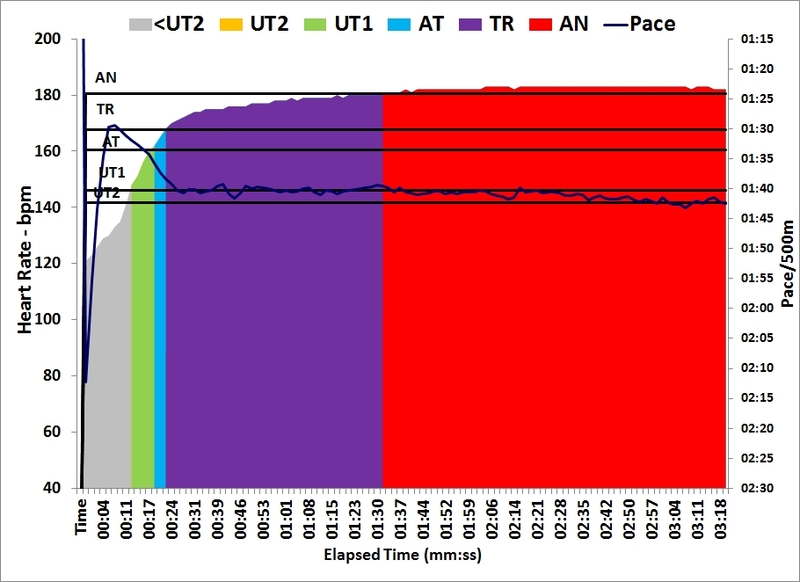 My 500m, 6k, 60min and half marathon are on the fitted curve, while my 1km and 2km are slower. That kind of corresponds to my feeling. I should be able to do faster times on the 1km and 2km. By about 2 to 5 seconds. Something to try for next Erg season.